The origins of the Nelson Street Society can be traced back to 16th November 1819 when Metheun’s Long Room was being used for early day meetings. In 1822, a preaching room was opened in Garden Street, Gateshead, and regular services were organised by friends from Newcastle. The extent of poverty in the area resulted in the room being closed and rooms rented around the town including the long room in the Brandy Vault’s public house on Church Street, from which the early Ranter’s were expelled for “being too noisy“! 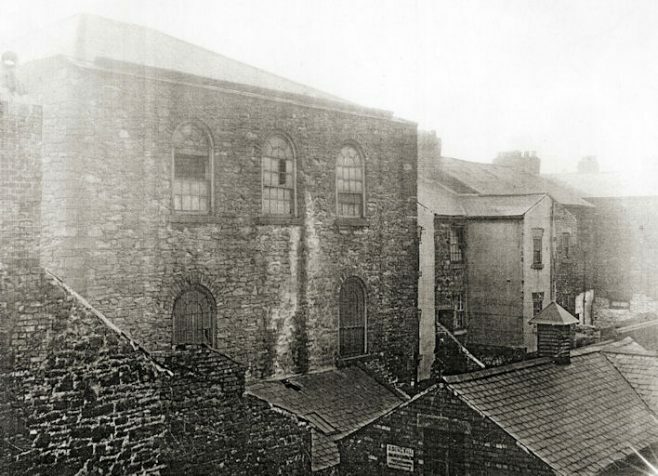 A large chapel was eventually constructed on Mulgrave Terrace in 1838 however the treasurer absconded with the funds and the building had to be given up. Several more rooms were rented until the foundation stones were laid of the Nelson Street Chapel on 17th May 1853. The chapel, with seating for 400 was officially opened on 1st January 1854 by Ralph Fenwick. In the early 1870s, an extension was provided for the Nelson Street PM Day School which catered for 185 children. At this time, the chapel was still in an ideal location but by 1886, surrounding properties had deteriorated and it was decided to sell the building and consider a move away from the town centre, to Durham Road. The Primitive Methodist Magazine for March 1854 contains an account by W Dent of the opening of Gateshead Primitive Methodist chapel. The recovery started with the opening of a small room in West Street, and as things progressed an effort to raise funds for a new chapel began in 1850. It took a while, but a plot of land was acquired from Mr CJ Pearson for £190 and the foundation stone was laid by “our old and popular friend, Mr H Hebbron,” on Whit Monday (May 16th) 1853. The number of those from “other evangelical denominations” was particularly pleasing. Building the new chapel was not straightforward – it was hard to find a mortgage and one of the three contractors “fell victim to the fearful epidemic that was then hurrying off so many busy mortals into the eternal world.” However, the chapel was opened on January 1st 1854. Next day there was a tea meeting where the addresses were “moderately good.” Opening sermons were preached by W Dent, Mr Hebbron, Mr Hallett and H Kendall of Sunderland. 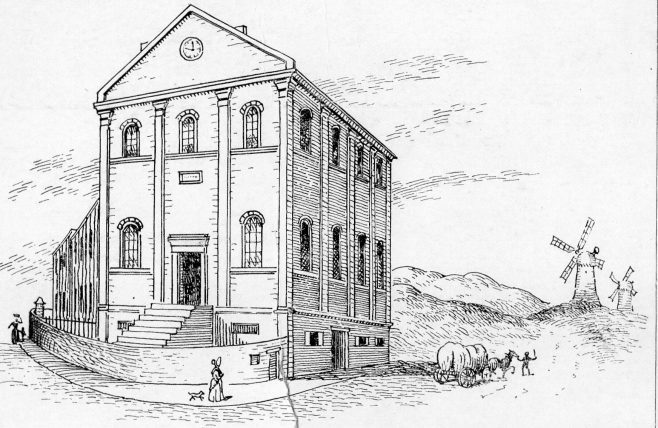 The chapel measured 40′ x 41′ outside and accommodated 376 people. There was a school room below the chapel and a double vestry. They had sufficient room for a future gallery should it be needed and land for a house behind the chapel. I’ve moved here content from a second page on Nelson Street which was based on an article in the Primitive Methodist magazine. There was also the following comment contributed in April 2017 by the Newcastle District Archivist which gave additional information. “The Primitive Methodists began meeting in Gateshead Town on 16 November 1819 when Metheun’s Long Room – previously used by the Wesleyans – was rented by them. 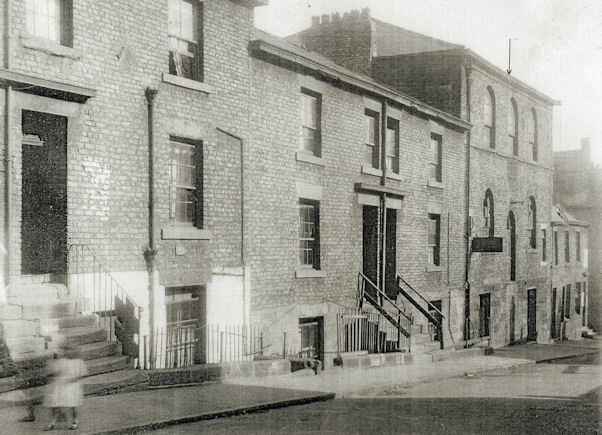 In 1832, a preaching room was opened in Garden Street and regular services were conducted by preachers from Newcastle. The extreme poverty in the Garden Street area (Hillgate) was amongst the factors that resulted in the room being closed and the little Society moving to the Brandy Vaults public house on Church Street. the owners mustn’t have approved of their singing or exhortations as they were expelled from there for being too noisey! From there the Society met in a member’s house (registered at Durham on 2 November 1825) and from another (registered at Durham on 4 May 1833). This latest “house” was known as the Sail Loft and was at Church Walk near to St. Mary’s Parish Church. The building was destroyed in the Great Fire of Gateshead in 1854 when the Wesleyans were using it. In 1838, a large chapel was built at the junction of Mulgrave Terrace and Grosvenor Street though they were forced to abandon there shortly afterwards when the Treasurer stole all the chapel’s money. The congregation moved back to Church Walk and from there to Swinburne Place then to a meeting room at West Street. The chapel referred too above, is the replacement for all of these and was Nelson Street, opened on 1 January 1854. Nelson Street soon became head of the then Gateshead PM Circuit which covered considerably more than Gateshead.